1. Dab 1/2 teaspoon (more or less) of cream cheese on top of each chicken tender. Sprinkle a scant 1/4 teaspoon of peppers over cream cheese. Fold or roll chicken to enclose cream cheese mixture. 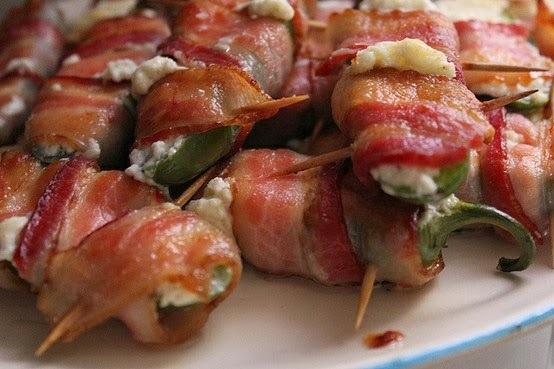 Wrap each roll with one piece of bacon and secure with a toothpick. 2. Grill until bacon is brown and crispy on both sides. Be sure to wear plastic gloves when handling fresh jalapenos. The oil will attach itself to your hands and is not easily washed away. An inadvertent swipe of the hand close to your eyes could be an unforgettable experience. For reference, if you are substituting for the chicken tenders (i.e. dark meat, large pieces of chicken breast, game meat), the size of the tenders I used were 5-6 inches long and 2-3 inches wide before flattening and cutting in half. Try flattening meat inside a zip-lock bag as pictured above. No flying pieces, no contamination on your cutting board from the chicken, and cleanup is super easy.